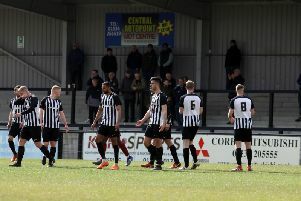 Corby Town returned to winning ways after a tough week for the club. This win and performance meant a lot to everyone at the club. The Steelmen were hit in the worst possible way at the start of last week. Two break-ins in as many days left Corby counting the cost of thousands of pounds worth of damage. You see too many of these stories these days with football clubs being the victims of break-ins. All clubs rely on volunteers to help run things and there is nothing more deflating than being targeted in this way. Ultimately, of course, the manager and players can only really control what happens on the pitch every Saturday afternoon. And, on this day, they delivered the perfect tonic with a good performance and important victory. Three points won’t fix what happened off the pitch but it at least would have provided some welcome relief for those behind the scenes. Corby are nicely in the mix at the right end of the table. After back-to-back defeats, this was obviously a much-needed victory. And with a third of the season now done, the Steelmen can be happy with their work so far. They sit in third place, five points off the leaders so they are right in the mix in what looks like it will be a close race for the one automatic promotion place. They can’t afford many more slip-ups in the immediate future, however. A big month lies ahead. A game of few chances but the Steelmen were clinical. It seems strange to say that a game that produced five goals didn’t have that many chances in it but that was the case at Steel Park. But when Corby clicked in the final third, they did it in impressive fashion and, more importantly, they were clinical when the opportunities arrived. It was a good day for Elliot Sandy as he played Jordan Francis in for the opener before scoring the other two goals - both set up by Jordon Crawford - himself. While Sandy is fit and firing and the service is there, Corby will always know there are goals on the pitch. There are still defensive issues that need to be ironed out. This could and probably should have been a routine 3-0 victory for the Steelmen. But their defensive frailties struck for a 10-minute spell and Aylesbury United took full advantage to draw level at 2-2 after the hosts had looked comfortable. The ‘goals against’ column continues to be the area of focus for Corby. While not disastrous, it could be better. And, if they are to be part of a sustained promotion challenge, it is the area that will need to improve. A tough test awaits this weekend. An impressive run of form has seen Berkhamsted move up to fourth place in the Evo-Stik League South Division One Central and they play host to Corby at the weekend. It will be another big game for the Steelmen but one they are more than capable of getting a positive result from if they can put things together from an attacking point of view. With the teams immediately above them making few mistakes at present, it’s important Corby stay on the winning trail and ensure they stay right on the tails of the top two.